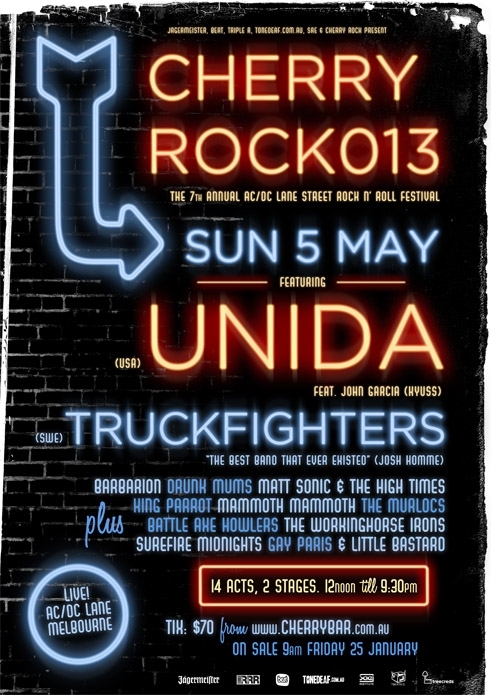 Monoliths of modern Stoner Rock, Unida from the Californian desert and Truckfighters from Sweden will both play Australia for the first time as co-headliners of the Cherry Bar’s 7th annual AC/DC Lane street rock n roll festival, CherryRock013 on Sunday 5th May. Unida will feature Kyuss lead singer John Garcia. After the original demise of Kyuss, Unida were together from 1998 to 2003, which included the release of the seminal stoner classic album Coping With The Urban Coyote. Unida reformed in 2012 and Australian hard rock fans have only dreamed that Garcia and Unida would be seen on stage here. CherryRock013 makes stoner dreams come true. Other bands confirmed for the coveted 14-act double-stage bill include King Parrot, Barbarion, Matt Sonic & the High Times, The Murlocs, Mammoth Mammoth, Gay Paris (Syd), The Surefire Midnights (WA), Drunk Mums and Battle Axe Howlers.